Batman eating a Burrito: Bighead & Batman together at last! Bighead & Batman together at last! I realize that neither of these characters is eating a burrito. 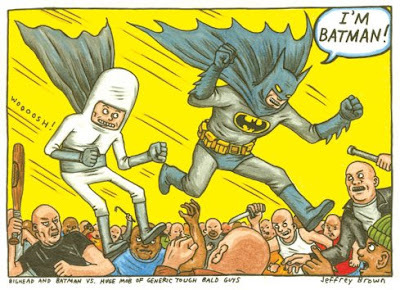 However, I really wanted to post it so that everyone can see what an amazing artist Jeffrey Brown is (if they didn't know already). Talk about an epic pairing!